SAReptiles • View topic - THA new venue. The THA is pleased to announce that after many years of being based at the Transvaal museum we have had to find a new venue due to the deteriorating of the inner city. The Pretoria University (Tukkies) has agreed to allow us to use their facilities for future meetings. It is far easier to get to and is far safer as far as parking etc is concerned. We will be meeting in Hall 43 which is almost slap bang in the middle of the grounds. 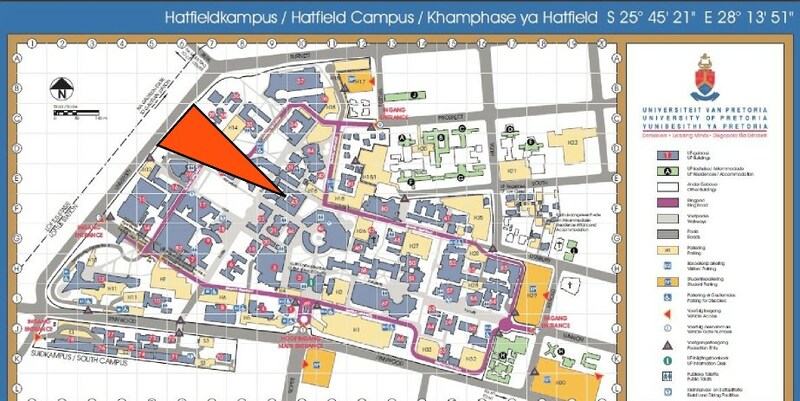 It is best to enter through the gate on Lynnwood road and drive all the way around the university until you get to the parking closest to hall 43. Below is a map showing exactly how to get there. Follow from the purple line (Main entrance) from the bottom and turn right. The meeting will be 19h30 for 20h00 as per usual and this month the talk will be by our newest committee member Andre Prins about External parasites on Lizards of Goro Game reserve as well as a few other interesting specimens of reptiles found during the survey. Hi Guys i would like to become a member Please advise ? "Use Your Enemy's Hand To Catch A Snake"
Scar you can just come to the meetings and join there. Many thanks to Andre for the talk on their research project on ticks and mites on reptiles. Next time we need a more detailed map to the venue (and back out again ). Got lost inside the University and when I left, I got lost in Hatfield. Thanks to Andre and more to Arno, the venue is much better. As a general rule, the more we learn about snakes and their ways, the less fear we have of them. This is usually not so with the Mamba. The more one learns of his ways, the greater grows the dread of him. He, without doubt, is the King of Snakes in South Africa. For quickness, aggressiveness, and the deadly nature of his venom, he has no equal. @ RaD check for the THA meeting topic, but the meeting is every last Friday of the month 19:30 for 20:00. The topic and guest speaker will be mentioned in the Meeting topic posted by the admin for that month.